The use of digital radiographs have reduced the exposure to xrays by 80-90 percent. The images are instantly viewed on a computer screen with remarkable definition. In our office, we use a Zeiss Surgical Microscope. 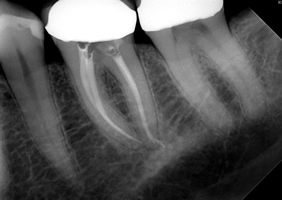 It provides enhanced visualization of the endodontic access or surgical area up to 25 times. This is especially beneficial for accurate visualization of complex anatomy cases, for locating root fractures or defects, for root-end surgery, for removal of separated instruments, and for locating canals. It is important for the success of root canal therapy to clean and fill to the very end of the root, without extending beyond or being short. The electronic apex locator aids in measuring the length of the canal by determining accurate position of the apical constriction through a resistance force.